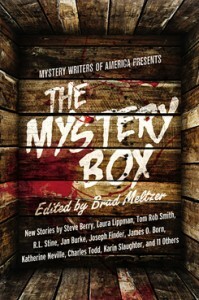 "Waco 1982," by Laura Lippman, in The Mystery Writers of America present The Mystery, Box, edited by Brad Meltzer, Grand Central Publishing, 2013. I opened, well, e-opened the new MWA anthology, and came across this nice and melencholy tale. Marissa is a new and somewhat accidental reporter, on her first job in Waco, Texas. Her tempermental boss gives her what feels like a fairly pointless assignment: writing an article about the sort of stuff that winds up in the lost and found boxes of motels in Waco. And pointless it is. But it turns out someone does have an ulterior motive, and there are layers of small city life under the surface that even that person is unaware of... A nicely brooding reminder of life between the sexual revolution and the AIDS crisis. Oh, and before the journalism market went down the tubes, too. “Hangman’s Break” by Albert Tucher, in Ellery Queen's Mystery Magazine, July 2013. I have written before about the type of story I call the Unknown Narrator. That means that all the reader knows about the narrator is what other people say about him/her -- and those people are wrong. Tucher's story is a variation - the people really do know about the narrator's secrets, but the reader has to slowly figure them out. The year is 1969 and hero is a police chief who got his job in part because during World War II he fought alongside the son of the local industrialist. Now that same son is found hanged on a railroad bridge. Suicide, or something else? We learn the grim details of his war experience, and then we learn how the after-war yearas have effected our hero. And some rough semblance of justice is meted out. Hard to believe there is any medium I haven't already reported this, but my "The Red Envelope," winner of the Black Orchid Novella Award, is in the current, July/August issue of Alfred Hitchcock's Mystery Magazine. I also talked about writing it at Trace Evidence and found something different to say about the process at SleuthSayers. "The Gallows-Bird," by Kevin Mims, in Ellery Queen's Mystery Magazine, July 2013. Somebody said there are only 36 plots. I don't know about that but I do know certain plots show up in mystery fiction with greater or lesser frequency. Man decides to kill wife. Criminal gets hoist by own petard. Some of these things show up in every anthology or crime magazine you pick up. But I am more fascinated by the rarer plot, the one that you could probably fill one volume with if you put all the examples together. And one of those is what we are seeing today: An established writer and a novice writer conspire to commit a fraud on the public. I suppose the reason this subject interests writers is obvious. In effect, it is work chatter, right? In most examples I have seen the older writer wants to hire the younger as a ghost (See Donald Westlake's The Hook, for instance) but Kevin Mims has taken a different approach in this story. The older writer is a certified great novelist with tons of prizes and a niggling bit of self-doubt. His rival says he is over-rated because he is a life-time member of the literary establishment (studied under other top people at Ivy League schools who got him great reviews on his first book, etc.). So he wants his last novel to be published under the name of the young author, in order to get an honest judgment. "Footprints in Water," by Twist Phelan, in Ellery Queen's Mystery Magazine, July 2013. Twist Phelan juggles quite a lot of balls in this story and keeps them flying pretty flawlessly, I think. Henri Karubje is a detective in the NYPD and he is called out to help investigate the missing daughter of a Congolese family. The relationships between the people, and with their medicine man, neighbors, and priest, are complicated to say the least. Tangling the matter further is that Karubje is not their as investigator, but as translator. The lead detective is a newly promoted woman he has worked with when she was on patrol. The cliche here would be to have them in territorial conflict but Phelan chooses instead to have the new detective looking for more help while Karubje insists on making/letting her run the show. Karubje is haunted by his childhood in the genocidal conflict of Rwanda and he makes good use of his memories of that horror to sort out the motives and inconsistencies of the characters.